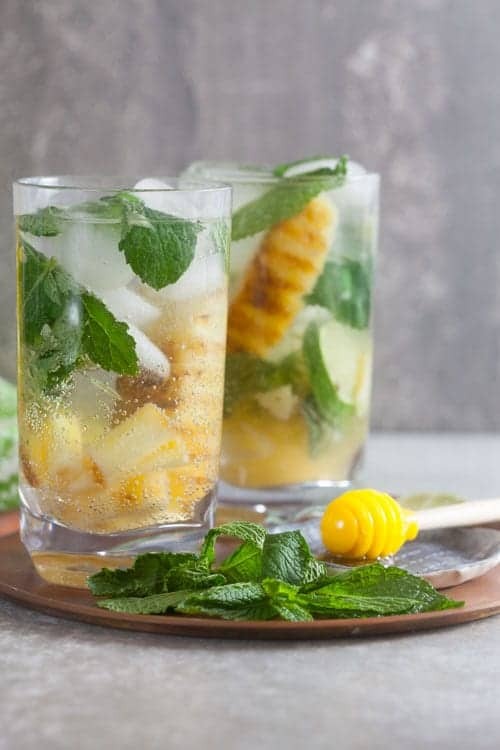 Grilled Pineapple Mojitos | Healthy. Delicious. These mojitos get tons of flavor from caramelized grilled pineapple, tons of fresh mint, and a kiss of honey. Every season deserves it’s own signature cocktail. In the cooler months, I was into moody drinks made with ingredients like bourbon, apple cider, and cranberry juice. Now that grilling season is approaching, I’ve swapped those out for fresher flavors like citrus, fresh herbs, and rum. The one element that remains a constant no matter the season is honey. I love that it adds another element of flavor in addition to sweetness. Plus it mixes well in it’s natural state, so you don’t need to fuss with making simple syrup – this is especially handy in the summer when you’re outside and don’t necessarily have a burner or a pot nearby. Lately, I’ve been all about these tropical grilled pineapple mojitos. They’re bright and cheery and remind me of everything I love about summer – there’s just something about pineapple that reminds me of sunshine and makes me smile. 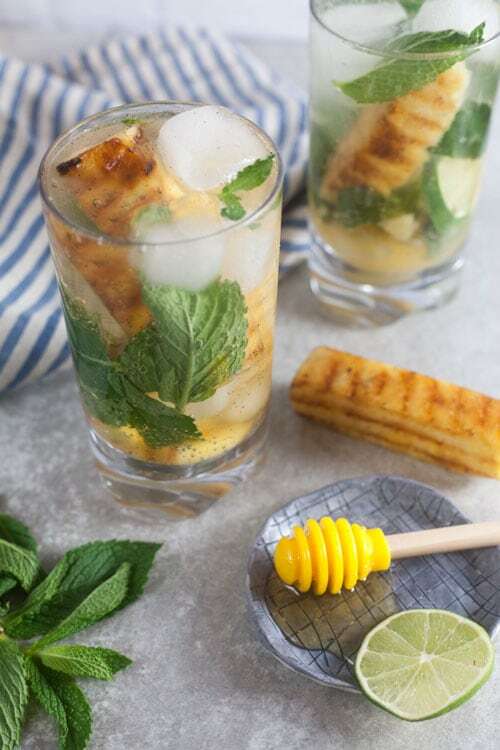 To make these grilled pineapple mojitos extra special, I toss pineapple wedges in a mixture of rum, honey, and lime juice, then throw them onto the fire. Grilling the pineapple softens its texture and brings out its natural sweetness, while the sugars in the marinade caramelize and pick up a subtle smoky flavor. 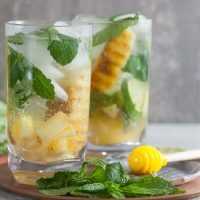 The grilled pineapple then gets muddled with more mint, lime juice and honey to ensure that there’s plenty of flavor in every sip before the rum and club soda are added. If you’re avoiding alcohol, these grilled pineapple mojitos make delicious mocktails. Just add more club soda in place of the rum. 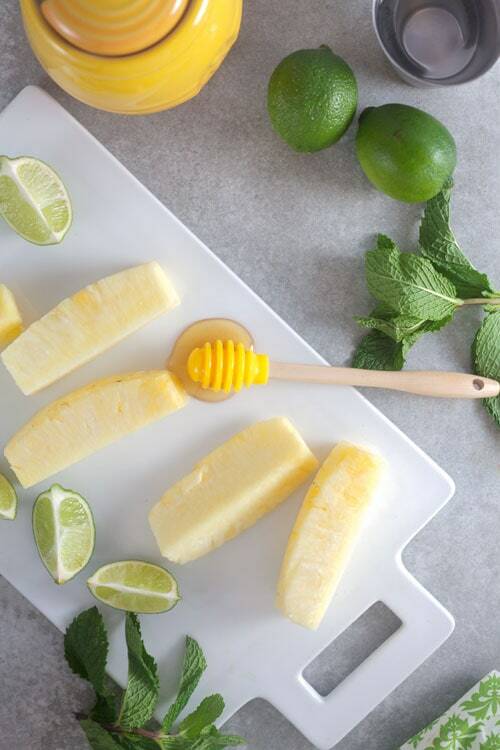 In a shallow dish, mix together the honey, rum and lime juice. Add the pineapple and turn to coat. Let sit 5-10 minutes. Heat your grill to medium high. Add the pineapple an cook 1-2 minutes on each side, or until the fruit softens slightly and golden brown grill lines appear. Remove from heat and let cool. Roughly chop half the grilled pineapple. Divide the chopped pineapple among 8 collins glasses. Add 2 lime wedges, 1 teaspoon honey and 10 mint leaves to each glass; muddle to combine. Stir in the rum, then fill each glass with ice. Top with club soda. Garnish with remaining grilled pineapple, lime wedges, and mint leaves. This post was sponsored by the National Honey Board. Thank you for supporting the products that keep me inspired in the kitchen. Mojitos are my favorite drink and these look amazing! Pineapple and mint are meant to be!